“There’s a turtle in the back of the backyard,” shouted my husband. I didn’t have any problems catching up with it. The angle it was walking toward the house made it easy to get close for taking pictures. The male and female red-eared sliders both have a red patch on the side of their head. They mate between mid-March and mid-June here in southern Illinois, and are active until mid October. there was a toad, still, not moving. It measured roughly three inches in length. They can live to 10 years, or even longer. They hibernate in burrows through the winter. I’m not sure what’s covering its eye. It was gone the next time I walked past … an extra eye lid maybe? The toad was gone in the evening when I walked by. I hope I’m lucky and see it again. Every spring I usually watch a turtle crossing our yard, heading west. and stayed where it was for about two hours. but I think it was a melanistic male red-eared slider. because I haven’t seen one in the yard this year. 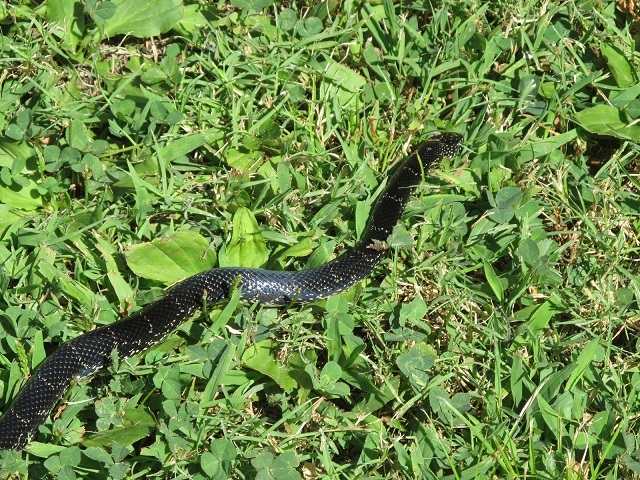 It brought back a memory of an encounter I had several years ago with a kingsnake. Many many years ago, after I started birding, I still hadn’t seen a wild turkey. I’d heard them gobble. There was an area up the hill from my camper, where I’d seen a lot of turkey scratching. Dressed in camouflage, camera in hand, I got situated at the base of a tree that gave me a good view of the area. There I sat … and sat … and dozed off. 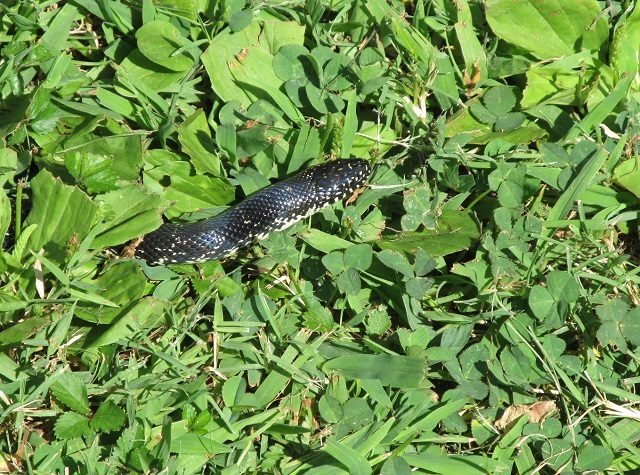 The wind started blowing … only it wasn’t the leaves rustling in the wind … it was a LONG kingsnake coming straight for me. It hadn’t seen me in my camouflage. Somehow, I held my camera, got to my feet and stepped backwards several feet. 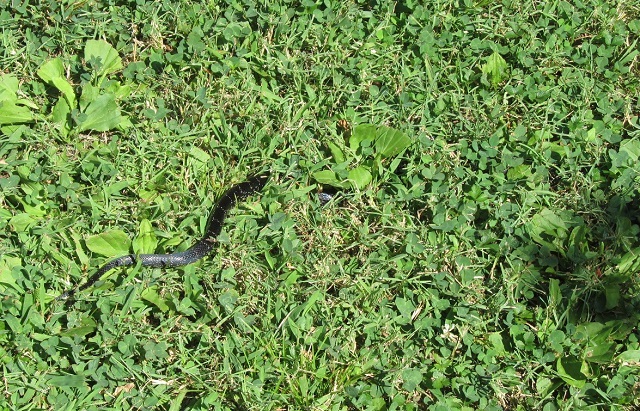 The snake stopped when it came to where I’d been sitting because the ground was warm. My hands shook to much to take a picture (The lens was zoomed in too close anyway.) The snake continued on, and I headed for the Blazer. It was in line to cross my lap if I’d been asleep. 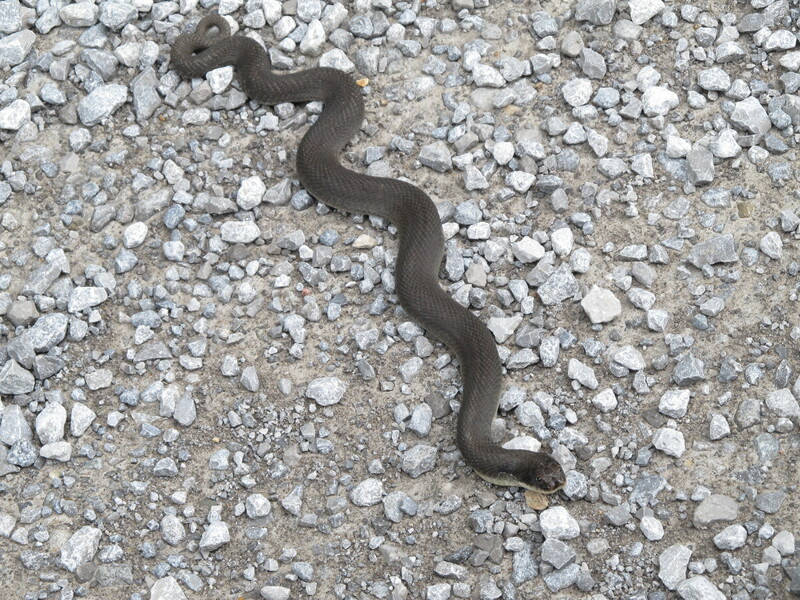 Anyway, there in the road was this brown snake. I didn’t remember seeing one like it before. It stayed frozen in place, even after I drove off. I’m waiting for my oldest son to identify it for me. 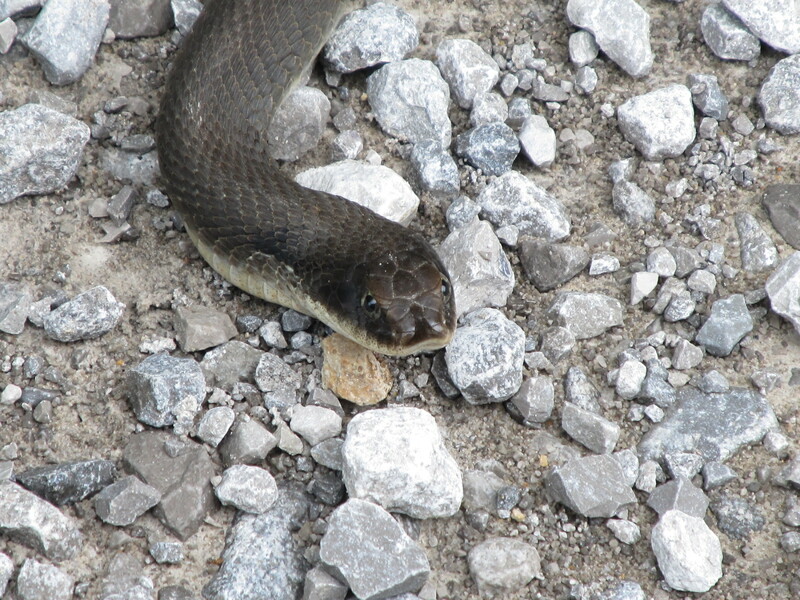 Keith saw my pictures and said it was an eastern hognose. It had apparently just shed. A small patch of the old skin remained on the side just behind the head. What had me confused was its lack of pattern.